The line around Yamayoshi Anago in Himeji. 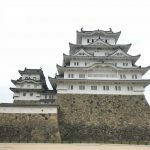 We were visiting the famous Himeji Castle in the town of Himeji (more in a later post), and had to cut short our visit because of S’s hunger pangs. 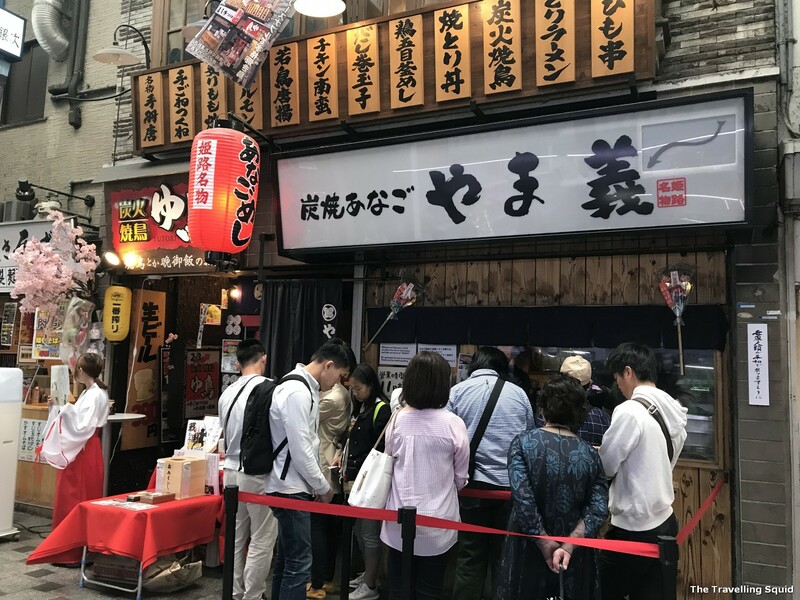 After doing a quick check on Tabelog, S found our lunch destination which sold Anago Don (saltwater eel rice). 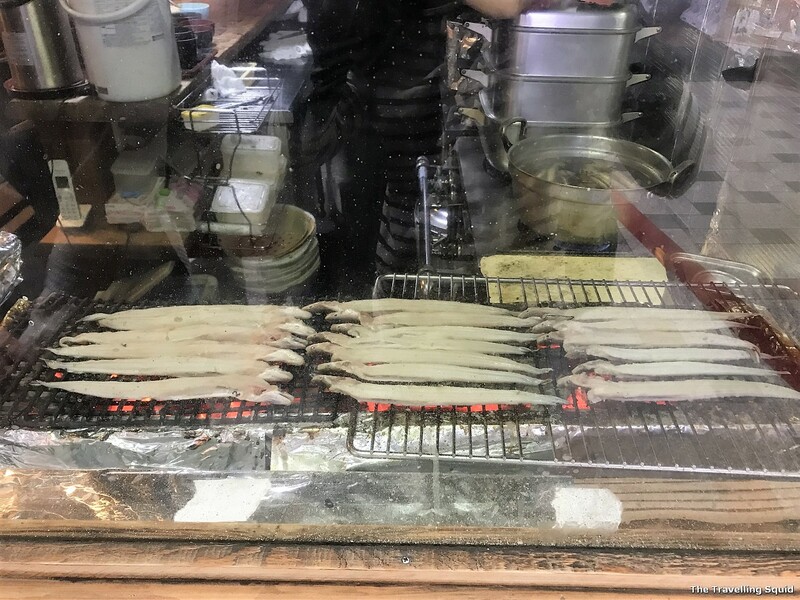 For the uninitiated, anago (saltwater eel) is the close cousin of unagi (freshwater eel). It tastes slightly less rich and oily than unagi. Anago is also known for its soft texture and sweet taste. 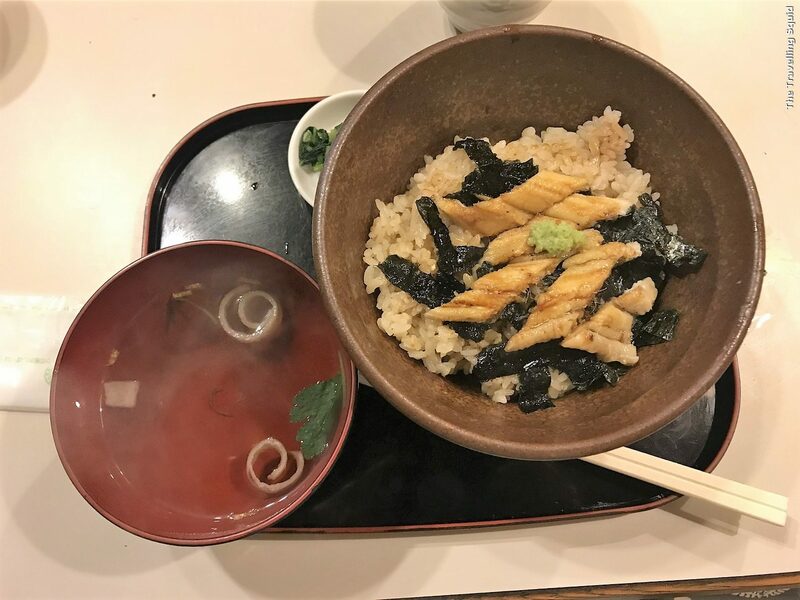 Here’s why you should visit Yamayoshi Anago in Himeji for eel rice – it’s delicious! Raw anago on the grill. That’s a lot of meat, wished I could have five of them. We arrived at Yamayoshi Anago in Himeji at about 2pm in the afternoon. 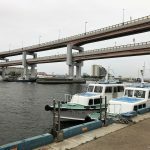 It’s a 5 minute walk from the JR Himeji station, and 10 minute walk from the Himeji Castle. There was still a line of about eight people around us. The restaurant is a 14 seater. We waited about 20 minutes before getting a seat. 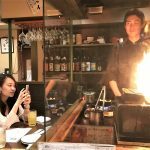 In between then, we could see how the chef cooked the anago over the grill, as there was a glass panel in between us and the kitchen. 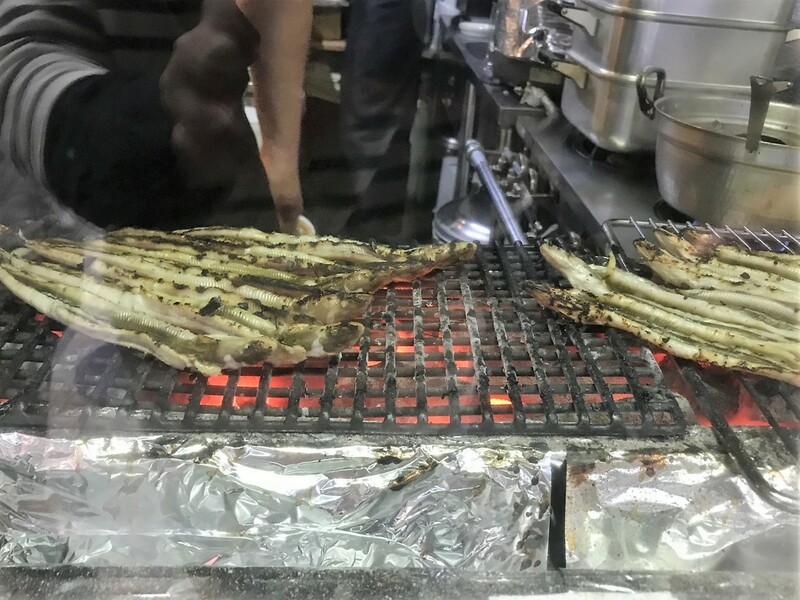 We figured that the chef’s fingers were quite resistant to heat as he placed his fingers very near the grill when turning the anago over. 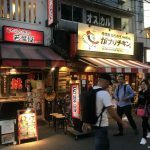 Yamayoshi Anago in Himeji felt like a little diner frequented by locals. Almost everyone spoke Japanese. It felt like a place I would go to while looking for food in a small town. 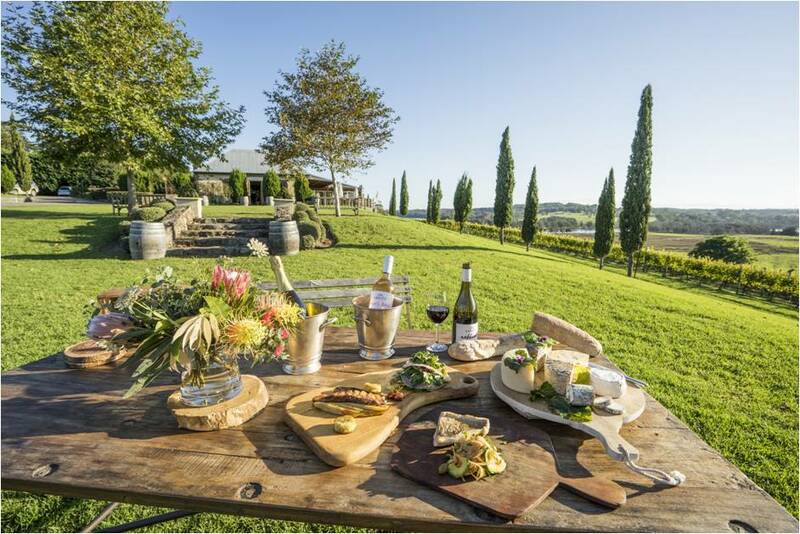 The staff were really efficient – from cooking the anago to serving dishes. 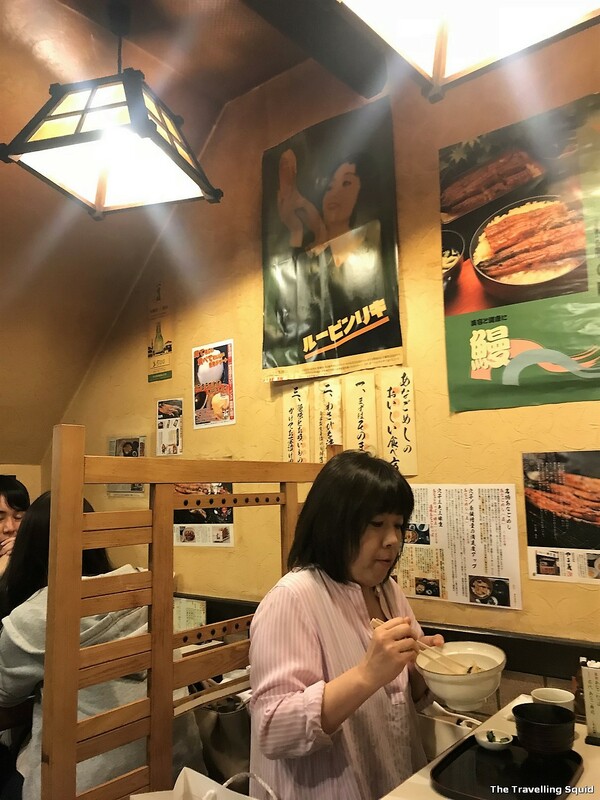 A sign that the restaurant must be good – I observed a teenage boy ordering his second serving of anago don right before he was done. Feels like I’m a scene of Solitary Gourmet. 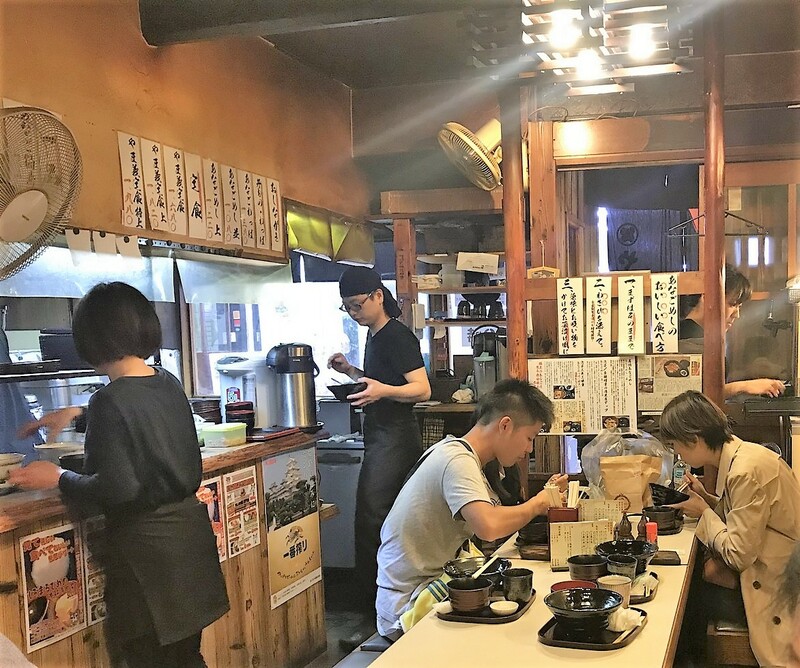 Yamayoshi Anago in Himeji for eel rice – Yum. Each bowl cost about ¥1,000 (SGD 12.10/ USD8.90). We ordered the Anago Don and it came with soup. I thought the pairing of the seafood, anago and teriyaki sauce was perfect. There wasn’t too much sauce which overwhelmed the delicate flavours of the anago. It was the right balance of savory, sweet and spicy flavours, brought about by a tinge of wasabi. It came with a bowl of clear soup. One of the patrons from Kodoku no Gourmet? Because most of the staff could only speak Japanese, we had some difficulties ordering, and chose a generic set. If only we had ordered more anago to go with the rice!! I must caveat that the anago portions are quite small, and I was quickly done with the anago before I could finish my bowl of rice. 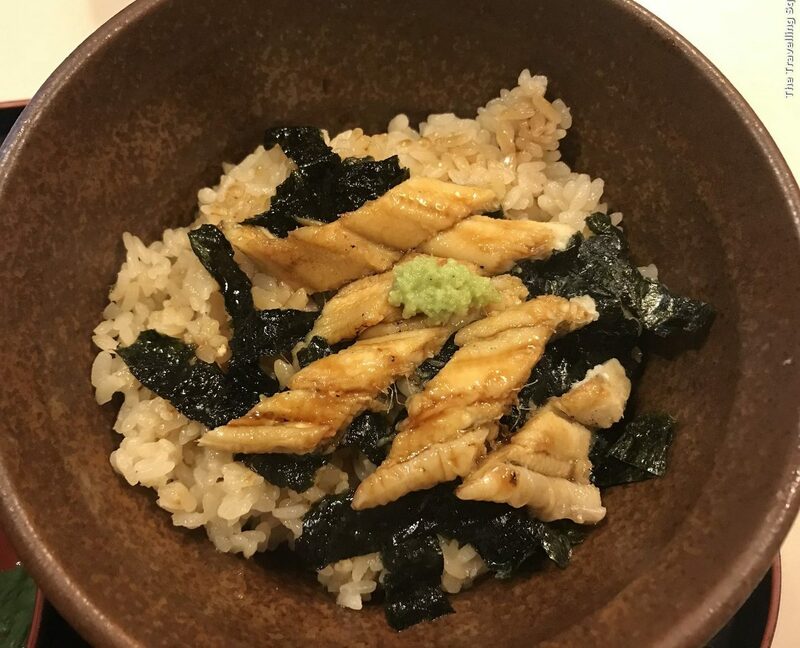 I would suggest that you order a double serving of anago to go with the rice – it only feels right. 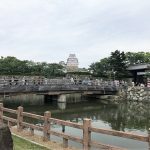 4 Responses to "Review: Visit to Yamayoshi Anago in Himeji for eel rice"